If all Morris County’s community stages stood in one spot, they’d amount to one amazing theater mecca. Convenient? Sure. But having them all in one place would take the fun out of it. 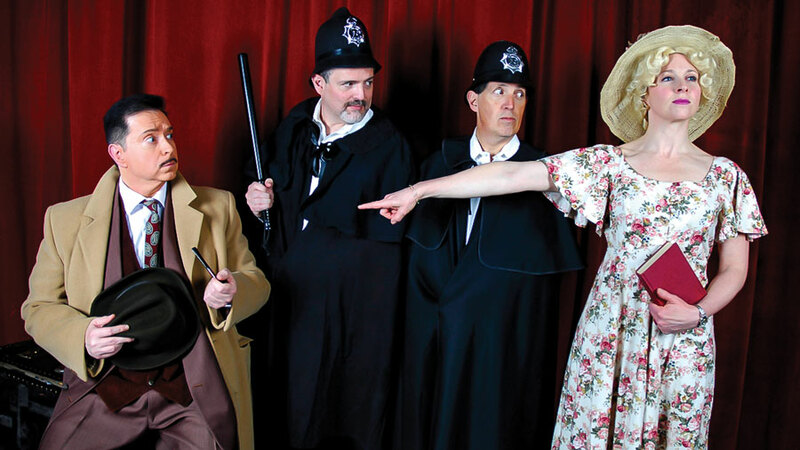 The 39 Steps, production at The Barn Theatre in Montville. Theater-going in northwest New Jersey equals adventure. It’s about discovering theater in unexpected places — by a lake, a golf course, or in the middle of a quiet residential neighborhood. In unexpected architecture — a brick-sided former morgue, old vaudeville house, or contemporary addition to a Stanford White designed Georgian mansion. Gertrude Stein famously once asked, “where’s the there there?” The answer, when it comes to Skylands theater is easy: “the there” is just about everywhere. Pretty much wherever you turn, there’s a show around the bend, and, odds are, one with personality, in a place with personality. Predictable? Not one bit. Counting or not, whatever your theatre tastes — musicals, dramas, revivals, premieres, experimental, you can find it here — in professional theaters featuring paid actors, designers, directors and staff or all-volunteer community theaters, where your neighbor could be starring in a show. But these days, whatever your tastes, there’s more to theatergoing than just showing up and sitting through a play. In northwest NJ, as nationwide, theaters faced with a stiff challenge from at-home and on-line entertainment, are inviting patrons to be part of the act. Whether a pre-show Q&A with the director, a post-show discussion with actors and a wine pour, or a class in Shakespearian stage combat, theaters are offering all sorts of off-stage audience action, usually tied to the theme or issue the performance explores. Let’s say the subject is romance, as it is in A Dog Story, a romantic comedy having its New Jersey premiere at the Bickford Theater at the Morris Museum this spring. Couples connected through the Match.com dating app, selecting Match Events can have their first date at the show, then follow up with dinner and plenty to talk about. “Why sit awkwardly across the table from each other?” asks Bickford Artistic Director Eric Hafen, “Why not watch a charming romantic comedy to soften the ice?” (So far, no dogs allowed in the audience, but a potential partnership with St. Hubert’s Animal Welfare Center for a food drive in connection with the production could mean a few canines might show up.) The Bickford also attracts theatergoers with a discount on dinner at the upscale Park Avenue Club, which occupies a renovated 19th century dairy barn around the corner in Florham Park. 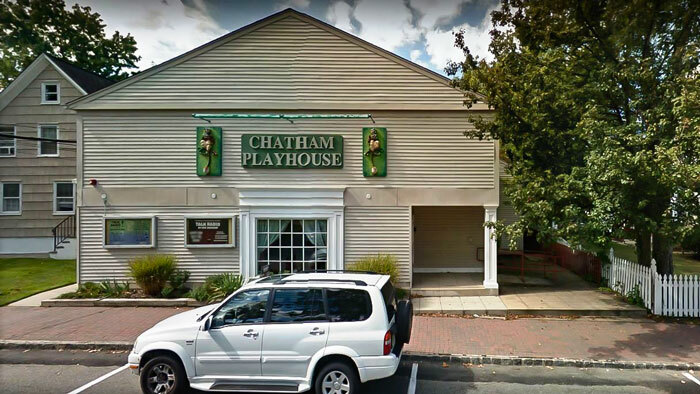 At the Chatham Players black box theater just off Main Street, a $15 ticket to Jersey Voices, billed as an “Evening of One Act Plays By New Jersey Playwrights,” offers one act plays (each about fifteen minutes long) plus a bundle of post-performance interactions. “It’s an inexpensive and adventurous evening of theater,” says Bob Denmark, the Players’ House Manager and, along with Andrea Young, Jersey Voices producer. “You get six one act plays, a talk-back and a reception.” The “talk back” solicits unvarnished feedback, with the director asking what the audience thought of the play and spectators asking the cast, who sits on stage, about gestures, intonations, expressions and techniques they employed in the performance. Denmark advises viewers to come prepared to love one, like two or three, and dislike or dismiss at least one of the plays, chosen from more than a hundred submissions each March. For those yearning not just to give feedback, but to make the leap from a spectator seat to the other side of the footlights, the area’s community theaters provide ample opportunity. In these houses, unpaid actors, stagehands, designers and directors form the team that delivers performances, everything from revivals of Broadway and off-Broadway plays (The Chatham Players, active since 1922, is staging the perennial favorite Grease in May), to new works being tested through staged readings. Joanne DeCarolis, of Dover’s Little Theater encouraged her husband, Lee DeCarolis, an architect with an engineering background, to write a play about a 1970s intrigue surrounding New York’s iconic Citicorp building. A staged reading of his work, The Serene Secret, (she’s directing) premieres at the end of March. The “Serene” in the title is an acronym meaning: Special Engineering Review (of) Events Nobody Envisioned. What were the events? A design flaw, discovered well after construction, meant the 59-story skyscraper essentially built on stilts, was likely to collapse in very high winds. As a hurricane approached the city, endangering the lives of countless people in the building’s vicinity, urgent secret repairs took place at night, with any evidence of the work removed before the building opened to office workers in the morning. Before or after taking in Serene, it’s a short walk from the theater’s quiet neighborhood to West Blackwell Street, with its pre or post theater dining options, including the Six West Bar and Grill, which serves up sangria, tapas and empanadas. While many local theater companies like the Little Theater sprouted in garages, churches, or schools as a way for residents with theatrical talent to find camaraderie and artistic expression, they’ve ended up providing entertainment for a wider audience and often now occupy homes of their own. The Barn Theatre, on Skyline Drive in Montville, now in its ninetieth season, began in an expanded chicken coop in the side yard of a home in nearby Mountain Lakes. But don’t let community origins mislead you. Auditions can be competitive and, featuring seasoned and polished community theater actors and directors, these theaters can offer compelling sets and performances that are crowd pleasers even with theatergoers who are no strangers to the Great White Way. If you’re inclined to spend a spring weekend close to home and are up for a live performance double header, you can contrast professional and community productions in one easy sweep, at two theaters just five minutes from each other. Take in matinee of Our Mother’s Brief Affair (which premiered two years ago with Linda Lavin in the starring role at the Manhattan Theatre Club) at the Women’s Theater Company adjacent to the Knoll Golf Course in Parsippany. Then head off to the historic (1770) Montville Inn for cocktails and dinner, and on to the Barn Theatre (in a red shingled mock barn building at the dead end industrial/residential road) to see The 39 Steps, arriving in plenty of time for an 8 p.m. curtain. Altogether, it’s a less than three-mile loop. Don’t let the name fool you; the The Women's Theater Company was founded by women, but the plays it produces cast and appeal to all genders. “The Women’s Theater title is only because three women sat around a kitchen table and said, ‘let’s start a theater group,’” explains Barbara Krajkowski, executive director and founding member. At the same time, she continues, “I try to pick a topic that offers a woman a great acting role as opposed to being a walk on.” The company favors plays that are “a little bit off beat,” she adds, rather than more standard Broadway revival fare. Just a couple of miles away, another theater offers family fare both indoor and outdoor attractions. You can picnic or just relax in the garden by the Pax Amicus Theater overlooking Budd Lake, then head into the “castle” to see Radium Girls, about the unexpected consequences of Madame Curie’s experiments. 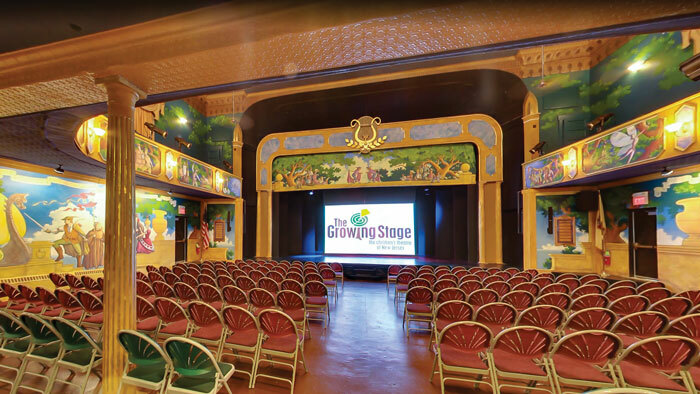 For anyone with an incurable case of the theater bug, fascination with theater history, and funds to spare, there’s the nearly hundred year old Darress Theater on Main Street in Boonton, said to be one of the country’s last surviving vaudeville houses designed so the audience enters under the stage. 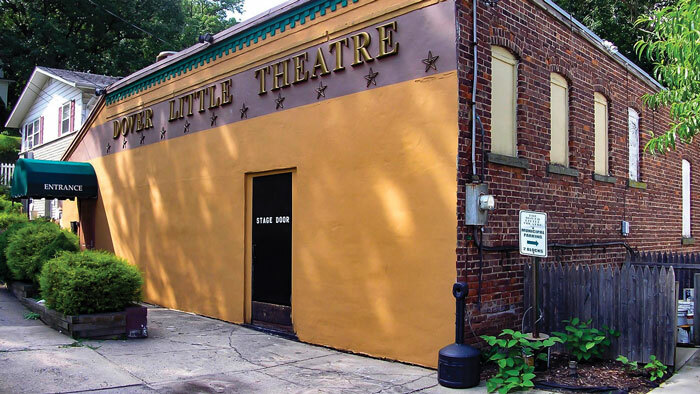 Home to many professional and community theater ventures over the years (including a stint as a movie theater) and in need of a facelift, it’s on the market for just under $1 million.